The Labrador Duck is a duck of many names often referred to as the ‘pied duck’ or ‘skunk duck’ because of its contrasting black and white appearance. Not a great deal is known about the now extinct Labrador Duck, however it is believed that the species died out some time in the 1870’s. The last reported sightings of the Labrador Duck was in New York in 1878, however the ‘last’ preserved specimen was shot in 1875 as far as most are concerned. 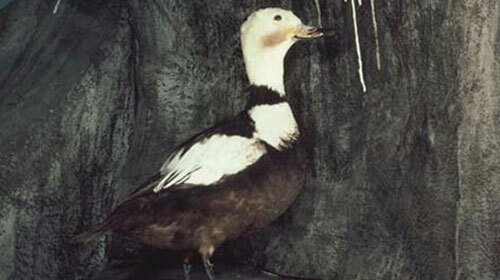 The Labrador Duck fed primarily on mollusks and plankton and had a unique bill that had evolved to be very wide with a number of bone plates inside used for filtering food, this set the Labrador Duck apart from any other ducks in the region and would be key to identifying one if any still exist in the wild. 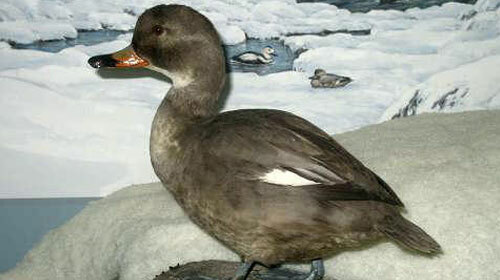 It is unclear today as to what caused the extinction of the Labrador Duck, however popular theory suggests that it could have been a combination of hunting and lack of available food for the Labrador Duck due to over harvesting by humans. The problem with this theory however is that the meat of the Labrador Duck wasn’t seen as good quality so wasn’t very profitable for hunters. Other suggestions have been made that rather than the Labrador Duck being hunted relentlessly for meat it was in fact hunted for its feathers as feather trade in the region was big at the time. Some also suggest that it may have been over-harvesting of the Labrador Duck’s eggs that led to a serious decline in population. Although the theories mentioned above could possibly have contributed to the extinction of the Labrador Duck, none of these theories can actually be proven and so many still debate over the extinction of the Labrador Duck, not willing to accept the current theories. Some have suggested that over-harvesting of shellfish such as mussels may have led to the decimation in population as its believed these may have been a major food source for the Labrador Duck throughout the winter. i liked it .i wish that you send some more information about extinct species.